Compared to the comic book covers we praised last year, a few points stick out for the class of 2015: 1) Digital painting is rivaling, if not eclipsing, bristol board, pencil and ink. 2) Good comic covers rely just as much on design and typography as traditional illustration. 3) The entire concept of ‘house style’ is even more arbitrary in cover art. A few names specifically stood out over the last 365 days in these regards. Mike del Mundo’s work on Weirdworld and Elektra revealed a comically talented sense of versatility, articulated through work both clever (Elektra’s shadow stretching into a sai) and visceral (Arkon’s throbbing, bloodied Barry Windsor-Smith physique). 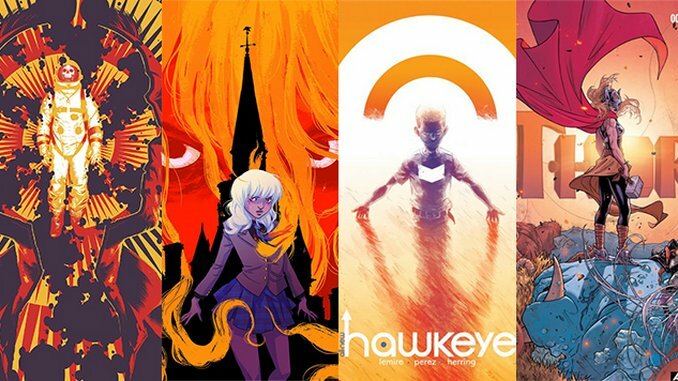 David Aja’s screen-printlike renderings on Karnak and Hawkeye advertised the gritty, uncompromising twists and turns lying inside Marvel’s favorite cult figures and Tula Lotay’s lush line work underscored a strong sense of sensuality and vulnerability. Declan Shalvey, Sean Murphy, Jock, Becky Cloonan and countless others showed off their skill at conveying the entirety of a story in one image. Check out the gallery for our favorite covers of 2015.